Many parents find the days and weeks immediately after surgery to be an extremely emotional time. You may naturally be very anxious about how you will react when the pressure bandage is removed. 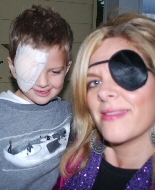 Many parents feel enormous relief once their child has returned to the ward, seeing the child is “still my little girl/boy”, despite the bandage. Allow yourself to own your feelings and know that they are natural reactions. Talk to your child’s doctors and share any concerns you have. They will be able to offer guidance on preparing for this stage of the enucleation process. Often, talking with families who have been through this process is most helpful, and expressing your own feelings of loss. Tears can be very cleansing, and grief is a normal response to the loss of your child’s eye. You will be given anti-biotic drops to put into the socket 3-4 times a day for several weeks. They can be put onto the conformer surface, and do not have to go through the hole to be effective. You will also need to remove any mucous build-up from the eyelids, gently wiping it away with a clean cloth dipped in boiled water. Fear of hurting your child or damaging the socket can cause great anxiety. The nurse will show you how to give drops and clean the socket, but talk with her about your concerns. Practice before leaving the hospital, so you can work through any anxiety with the nurse. Eye make-up can be worn as normal once the socket has healed from surgery, usually in 4-6 weeks. Hypoallergenic products reduce the risk of allergic reaction. As the socket heals, swelling recedes. The conformer may fit less snugly, and occasionally it can fall out. This may be very upsetting, but it is not an emergency and will not harm your child. Clean the shell with clean water and, if you feel confident, try to replace it. Remember, your child takes cues from you – if you are calm, your child will also be calmer. The eye department at your local hospital is the best place to go if your primary doctor is unable to help. Contact your child’s ophthalmologist or ophthalmic nurse if you have any concerns. Keeping the socket dry and clean for the first month is vital. So avoid activities that expose the eye socket to water or dirt, such as the sandbox or swimming. Once your child’s ophthalmologist has given the go ahead, you can resume these activities. Your child is still the same child she was before surgery. Her personality, beauty, talents, likes and dislikes were not removed with her eye. Continue to treat her as the beautiful child she has always been. She will pick up important messages from your own attitude to the enucleation that will set her on her future path.